Update, 10/5/2015: Scribd is terrible now. People keep trying to make “Netflix for books” happen. It’s probably because someone out there thinks I don’t have enough to read. I was definitely skeptical about these services at first because I have always been perfectly happy getting too many books from my local library. However, once they started introducing options that included audiobooks and comic books, it wasn’t long before I gave a few of the all-you-can-read services a spin. Luckily, most of them offer a free trial month, so it was easy for me to get sucked in. 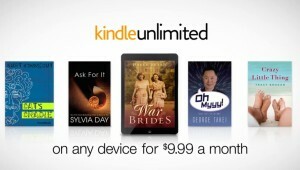 The first service I tried was Kindle Unlimited, Amazon’s $9.99 a month offering. Unlimited offers both ebooks and audiobooks, and thanks to Amazon’s close integration of Kindle and Audible, you can take advantage of Whispersync and download some books in both formats. Unlimited offers a lot of flexibility because you can read ebooks on Kindles or in Kindle apps, and listen to audiobooks in either the Audible app (which is fantastic) or any of the Kindle apps or devices. One of the killer hidden features of Whispersync is that it works even if you check out a Kindle book from the library, and Audible discounts show up even if you’re just borrowing the e-book. 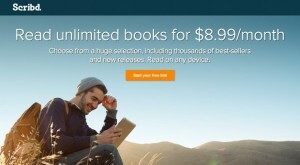 As far as the titles available on Unlimited, it’s best for independent books, Amazon exclusives and smaller publishers. I listened to the first two Wayward Pines books by Blake Crouch and then used the Audible discount for Whispersync titles to buy the first two Magic 2.0 books by Scott Meyer. I also read a Kindle single and a book on writing. If you want more mainstream books, Unlimited does offer a few good options like the Harry Potter series and The Hunger Games, but you won’t find most of the big new bestsellers on Unlimited. If you really enjoy independent genre fiction, Unlimited is probably a really good deal, but ultimately this selection wasn’t enough to keep me subscribed. Once I cancelled Unlimited, I decided to try Scribd, which costs $8.99 a month and works on iOS, Android, Kindle Fire and web browsers. Scribd was originally an online document publishing platform, but they announced a subscription book service a few years ago and that has completely taken over the site. Although I was first drawn to Scribd by their comic book library, I haven’t actually read a comic on there yet. Instead, I’ve mostly used it to listen to audiobooks. I was definitely impressed with their audio and e-book libraries when I first joined, but when Scribd announced a partnership with Penguin Random House Audio, their audio selection grew exponentially. If you’re a fan of audiobooks like I am, Scribd is more than worth the monthly fee. I actually cancelled my Audible subscription a few months ago and haven’t really missed it. It helps that I already own plenty of books on Audible, but Scribd is actually a strong contender even when compared to Audible’s full library. So far I’ve listened to Lucky Alan by Jonathan Lethem, Get In Trouble by Kelly Link, The Serpent of Venice by Christopher Moore and In The Garden of Iden by Kage Baker. I’m also currently reading At The Mouth of the River of Bees by Kij Johnson. Some of those are brand-new books. However, the Scribd app isn’t as polished as the Audible app. The default volume settings are way too quiet when I’m driving, for one thing. Although Scribd does offer some books in both e-book and audio formats, you can’t sync between the two automatically. Additionally, when you open a book, Scribd spends a long time syncing to their servers before the book actually opens. This happens even for books you’ve downloaded to your device. The e-book reading experience is at least as good as the Kindle app, but I’m not sure I’d ever choose it as my primary way to read e-books, just because I really prefer e-ink screens for text. That said, if they can beef up their comic book selection and work on improving the app, Scribd would be firing on all cylinders. I’ll probably stick with my Scribd membership for the foreseeable future, although I may try other services if they seem like good options. I know that Oyster is fairly well-liked, but they’ve said they have no plans to expand into audiobooks, so that’s a deal-killer for me. No matter what, I’m sure I’ll buy and borrow books from every place I can get them. I can never have too many books, after all!